The UFO is the find of a lifetime for Jack Slater, director of the United Nations-financed Organization for the Study of Aerial Phenomena (OSAP). Finally, after years of searching, he’s found a real flying saucer abandoned in an alien hangar—and it’s in perfect condition. While Jack and his OSAP colleagues explore the saucer’s secrets, the world watches as a meteor plummets to earth and destroys space stations as it falls. Too late, it becomes apparent the meteor is a missile, apparently fired by the Russian Federation. Detonating, it releases a terrible biological agent—a bioweapon seemingly beyond the capabilities of Russia’s current weapons technology. Now that the United States finds itself fighting a defensive war, the nation’s only advantage is the alien technology Jack discovered—technology that appeared at a suspiciously convenient time. Is humanity truly at war with itself, or is an external force playing a deadly game? William D. Nash’s fascination with UFOs began in junior high and lasted into the early 1980s, when he investigated a few cases, both independently and for the Mutual UFO Network. The origins of Invasion USA! go back to 1971, when Nash was in high school. Originally intended to be a short homemade movie script, the story grew and evolved over time but not without setbacks. Nash’s original final draft, loaned to a friend to get his opinion, disappeared—along with his so-called friend. Nash started a disc jockey business in 1981 and retired in 2013. When he told people he partied for a living, he meant it. 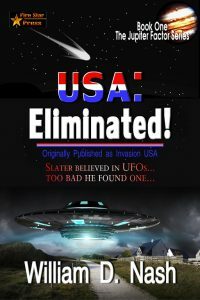 Retirement and a fractured ankle brought Invasion USA! back into Nash’s life—well, that and his wife’s insistence that he do something other than play video games in his retirement years.